Afternoon, visit Wat Phnom – the most famous buddhist temple in Phnom Penh. It was built in 1373, and stands 27 metres above the ground. It is the tallest religious structure in the city. The pagoda was given the name of Wat Preah Chedey Borapaut. Head to Kampong Cham, a former French trading post town and soak in the scenery of rural Cambodia as you drive past cashew nut plantations, rice fields, and traditional villages. Tour the town center before continuing to Wat Nokor, an evocative 11th century sandstone Buddhist shrine. Spend the afternoon at your lesiure in the sleepy riverside town of Kratie. 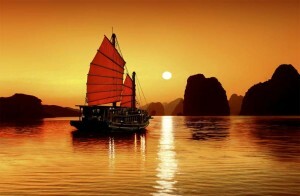 Enjoy a spectacular Mekong sunset with perhaps a cold drink this evening. The Kratie stretch of the river is particularly famed for its striking sunsets. Afternoon, cross the river to the island of Koh Trong and experience typical Cambodian village life. Upon arrival, you can decide whether you would like to take a local horse cart or pedal yourself around the island on a bicycle. Visit the island’s Wat where you will take part in a tree planting project initiated by a local farmer, in order to recultivate the once densely forested island. 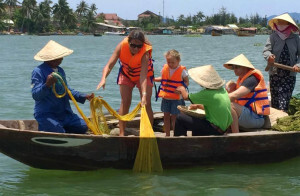 Continue with a visit to the Vietnamese floating village on the southern tip of the island. Return to Kratie by boat this afternoon. 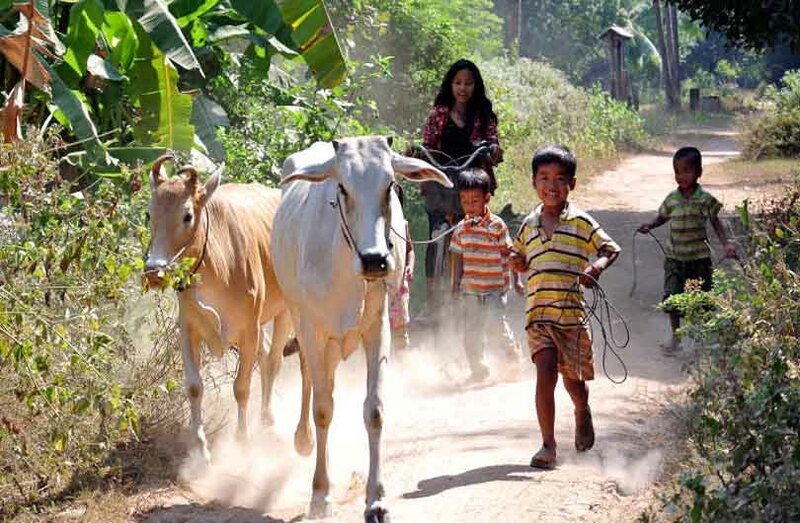 Depart for Kampong Thom passing through lush grasslands- home to a plethora of waterbirds- and watch out for ox-carts along the road, the main form of local transportation in this region. Although there are almost 1000 steps, climbing up Phnom Santuk Mountain offers spectacular vistas of the surrounding countryside and houses a small pagoda at the top. After soaking in the view, descend the steps and continue by road to Kampong Thom. This afternoon, will be spent at your leisure. Sambor Prei Kuk, 30 kms north of town, is a jungle-enclosed temple complex that receives very few tourists due to its remote location. However, a visit to these Pre-Angkorian ruins should not be missed. As you travel through the ruins on bike and foot, you will be awe-struck at the melding of architecture and nature, as the brick structures here blend seemlessly with the nature surrounding them. You will have the chance to visit and contribute to the sustainability of the people’s livelihood as the local community will prepare a simple but tasty lunch for you near the temples. Continue towards Siem Reap (3h). On arrival, check in to the hotel and enjoy the remainder of the afternoon at leisure. 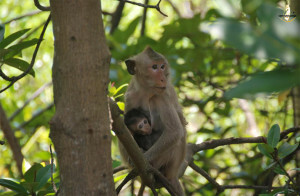 After breakfast, you will be transferred to the quiet Beng Mealea (1 hour drive). Enjoy a short walk through the dense jungle and discover the wonders of an overgrown temple, Beng Mealea, which lay undiscovered for centuries. From here, travel to the “gem” of the Angkor area, the pretty temple of Banteay Srey. 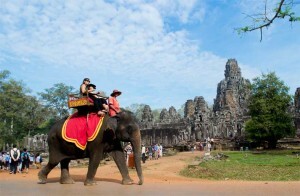 The so-called “Citadel of the Women” displays some of the finest examples of classical Khmer art. 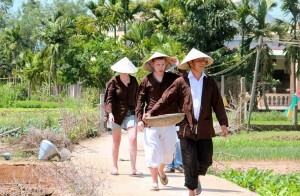 Evening, around 20.00, our tour assistant pick up from your hotel to go to Tran Quy Cap train station. He will lead you to your cabin on the train. After breakfast and a morning shower, we will walk from Sapa towards Muong Hoa valley where we can admire magnificient landscape. Here you will discover the wonderful scenery of Hoang Lien moutain ranges and meet Black H’mong tribes. Trek through terraced rice paddies and minority villages along the Muong Hoa River, where we can here a nice swim. We then cross the suspension bridge towards the Zay village, arriving at Ta Van village. Enjoy the great landscape surrounding the village. Enjoying the company and hospitality of our Zay family and homestay overnight in Ta Van village. Transfer back to Hanoi by night train. Morning, breakfast, fruits, coffee and tea are served on board. 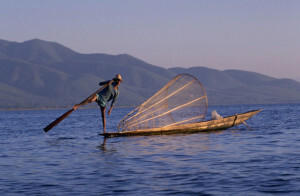 Cruise further and stop-over at a pearl farm to sea real peace cultivated by local fisherman. 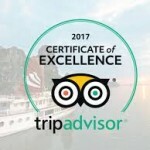 Check-out on boat and get on a local boat to cruise around Lan Ha bay to admire outstanding limestone island and islets. Arrive at bungalow on Nam Cat island which locates in the middle of Lan Ha bay. Enjoy the lunch on the island. Afternoon, boat trip to Viet Hai village and biking. Relax or join activities at bungalow: playing football, volleyball, play pool, badminton, fishing or kayaking to explore untouched area near by bungalow. Evening, buffet dinner at Bungalow. Go fishing or relax on the sandy beach, listening to sea wave at very peaceful and quite place. Overnight in bungalow on Nam Cat island. Enjoy lunch served on board. Say goodbye to the crew and disembark. Get on bus to go back to Hanoi. Arrival at hotel around 04.30pm. Morning, breakfast at hotel in Hanoi. Spend your leisure for relaxation until we transfer you to airport for your departure flight.